If you have chosen to do a same layout project, you will need to use the following 2 charts to cut your star and surround fabrics. Start with your 2 fabrics chosen for the star centers. Using the chart below, cut the squares for your desired size and layout from each of the star A and star B fabrics. So, for example if you were doing the 3 x 3 layout in a 32" size block, you would cut (45) 5" x 5" squares from your star A fabric and (45) 5" x 5" squares from your star B fabric. Now you are ready to cut your surround pieces. 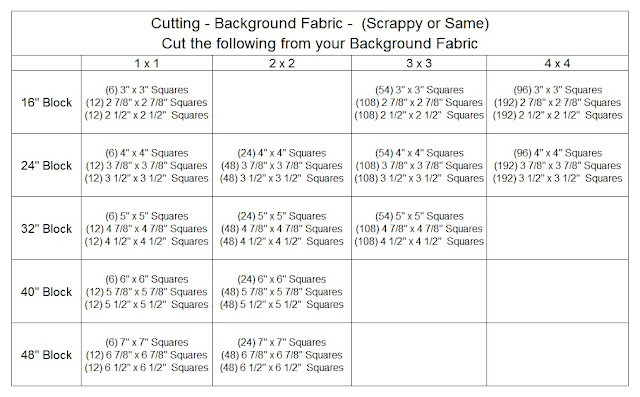 Using the chart below, cut the number of square for your desired size and layout from your Surround Fabric. So, for example if you were doing the 3 x 3 layout in a 32" size block, you would cut (27) 9 1/4" x 9 1/4" and then (108) 4 1/2"" x 4 1/2" squares. 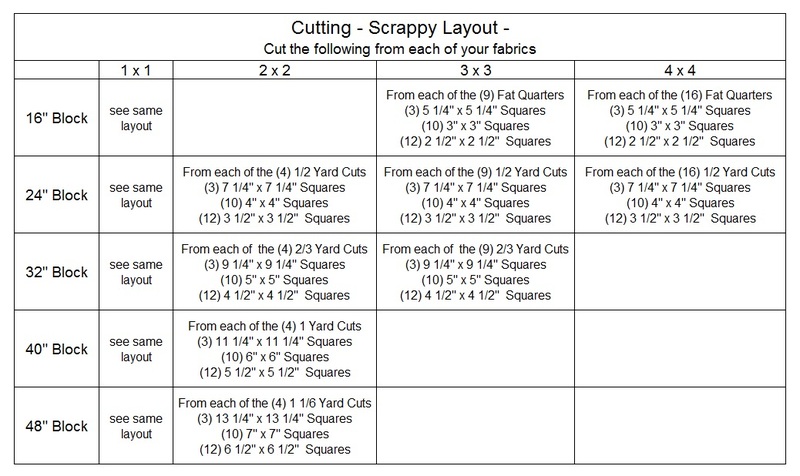 If you have chosen to do a scrappy layout project, you will need to use the following chart to cut your star and surround fabrics. Using the chart below, cut the squares for your desired size and layout from each of your fabric cuts, for a 2 x 2 layout there will be 4 fabrics, for a 3 x 3 layout there will be 9 fabrics and for a 4 x 4 layout there will be 16 fabrics. So, for example if you were doing the 3 x 3 layout in a 32" size block, you would cut (3) 9 1/4" x 9 1/4" squares then (10) 5" x 5" squares, and then (12) 4 1/2" x 4 1/2" squares from your first fabric. Then repeat that process for each of your remaining 8 fabrics. Whether you are choosing to do a same layout or a scrappy layout project, the background fabrics you will need are the same. Using the chart below, cut the squares for your desired size and layout from your background fabric. So, for example if you were doing the 3 x 3 layout in a 32" size block, you would cut (54) 5" x 5" squares then (108) 4 7/8" x 4 7/8" squares, and then (108) 4 1/2" x 4 1/2" squares from your background fabric. Here are a few helpful tips if you are new to cutting or just want to see how I like to cut. This is the way I like to cut, it is not the only way to cut, so if you do it different, great :) Do what you are comfortable with. This is just more tidbits that might help save your some time and eliminate waste. 1 - Always press your fabrics first, it takes a second more but will help in keeping your pieces accurate. I like to keep my iron at a super hot setting and use a little extra water from a spay bottle if I have any creases or folds that don't want to come out with a simple pass of the iron. 2 - Check the sharpness of your blade before starting to cut. Sometimes I like to layer my fabrics a bit, especially if I am cutting several fabrics all the same way (like in the scrappy layouts.) I never like to cut more then 4-6 layers at a time, and if I am cutting that many layers I always need to use a really sharp blade. But if you are still beginning, I don't recommend cutting more than 2 layers of one fabric at a time as the fabric really tries to shift the more layers you have. 4 - I like to cut in strips and use the lines on my mat as cutting guides rather than my rulers. Once I cut all of the strips I need, I slightly separate the different size strips, still keeping them aligned along the 0 horizontal line and the nearest vertical line, and then sub-cut the strip using the horizontal lines on my mat. This allows me to cut a lot of squares quickly. 5 - When cutting strips, I always like to start with the largest piece first. So I cut a strip the width of my largest piece and then sub-cut that strip as needed. When sub-cutting, I always start at the top of my strip and work my way down, thus allowing the scrap to be on the fold and creating 1 large scrap instead of 2 small scraps. Any extra of that strip can normally be sub-cut into smaller pieces needed thus eliminating waste. So let's show how I like to cut using the example we have been using so far, the 3 x 3 layout of the 32" block for the stars and surround. This is a 2/3 yard cut. So to start, I would align my fabric with the fold on the 0 horizontal line and trim a straight edge along a left hand horizontal line of my mat and trim the selvages using a horizontal line along the top of my mat (normally 21"). Then I would cut a 9 1/4" strip. From that 9 1/4" strip I would sub-cut (4) 9 1/4" squares. (You are always cutting in even numbers as you are cutting through 2 layers of fabric creating 2 pieces each time you cut.) 3 of those squares I put in my finished pile and the fourth I will sub-cut into (4) 4 1/2" x 4 1/2" squares. Then from my yardage I would cut a 4 1/2" strip and sub-cut it into the remaining (8) 4 1/2" x 4 1/2" squares needed. Finally, I would cut (2) 5" strips. The first strip I would sub-cut into (8) 5 " x 5" squares and the second I would cut (2) 5" x 5" squares and then scrap the remaining part of the strip. 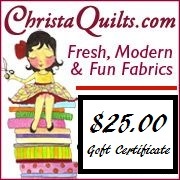 The Weekly Prizes are sponsored by the Christa Quilts and a huge thanks goes to them for their support of the Star Surround Quilt-A-Long. So let's get cutting!!! And if you have questions, don't hesitate to email me at happyquiltingmelissa@gmail.com. Have a Happy Quilting Day!! My day off tomorrow so I'm hoping to get this done then. Spent way too long picking out fabrics on the weekend, decisions, decisions! My bundle from Julie is on the way so hope to get to cutting later this week! Melissa, I'm in! I ordered my fabric and it should be here in time to cut it this weekend. I'm so excited! What do I need to do to join? Thanks so much! I'm so excited to start sewing next week! I don't think I have ever cut something with a 7/8" hehe, a great time to start, lol. So excited! Hard to pick just one color way:) Can't wait to get sewing. Hi, I can't figure out how to post my fabric pic. I'm ready. Lets get this down before Christmas. Hmmm, I'm interested in doing this quilt a long but I don't have 2/3 yard cuts of anything in particular. I noticed that each block is made of three fabrics though, so I might need to see if i can make what I have work. If I can I think it will be awesome! I'm so hoping to stay with this one and have a Christmas gift ready to go early! I just found out this QAL, am I too late to join? Dang it....love the looks of it and can always use from my stash, but appears I'm already behind, and I don't have a blog??? Jay, everything is cut - just in time (even though it's only a 1 block quilt..). Ready for the next step - thanks for doing this QAL! Up my photo if I don't have a link or blog? You can put your picture into flickr and then link to it there. If you don't have a flickr account, any photo hosting site will do :) Hope this helps and that it gets to you. You are a no-reply blogger so I couldn't email you. Melissa, I'm a little confused. I wanted to do a one-blOck Scrappy baby quilt, and the fabric requirements for "scrappy" are the same as "same". Then what cutting chart do I use?